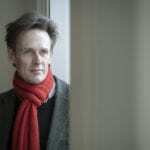 Next week, world-renowned tenor Ian Bostridge begins the first of three artistic residencies with the Seoul Philharmonic Orchestra, the first of its kind for the ensemble. Ian, a 14-time Grammy Award nominee, will travel to Seoul to perform three concerts over the week. The week is packed with three concerts and a number of promotional activities, including a press conference to 30 journalists and reporters representing the country’s interest in this auspicious, and inaugural, artistic residency. Ian’s first concert takes place on Tuesday 6 March at the Seoul Arts Centre. Programmed is some of the repertoire for which he is so highly regarded, including Schubert’s Schwanengesang, Beethoven’s An die ferne Geliebte, Vaughan Williams’s On Wenlock Edge and Mahler’s Lieder eines fahrenden Gesellen. The Mahler is arranged by Colin Matthews for tenor and ensemble and will receive its Asian premiere. The concert will be live-streamed by KBS Radio Broadcasting Company. Two further concerts will see Ian give performances of Britten’s Nocturne on the 10 and 11 March. Ian will return to Seoul in July and November for more concerts as part of his residency there.